The latest trend in the jewelry world is for what some are calling ‘narrative pieces’. These are pieces of jewelry — pendants, bracelets, necklaces, and especially charms — that come with a story. Jane Seymour’s eloquent tale of her mother’s advice to always keep your heart open led her to design a pendant that’s become remarkably popular. But you don’t have to be a jewelry designer to tell your life story with jewelry. You can convey the tale of your life with the jewelry you wear! 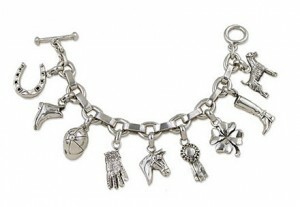 For example, take this piece, which we’re calling The Ultimate Rider’s Charm Bracelet. At first glance, it’s immediately apparent to even the most casual observer that the wearer loves horses. Look at the horseshoe charm, and the finely detailed horse head. Closer examination reveals more: the gloves, boots, and hat that speak to hours preparing for the show arena, the training, the grooming, the nerves fluttering like so many wayward butterflies in your stomach. And of course, the show ribbon — and who couldn’t use a little good luck, delivered in the form of a four leaf clover? Selecting jewelry that tells a story is an intensely personal process. You want to think carefully about what’s important to you, and then take the time to really browse through all of your options. It’s possible to be fashion forward and still very individual: Charm Jewelry is one great option. A golden wheelbarrow might remind you of wonderful days working in the barn, or a childhood when you were so excited just to be around the horses that you’d do anything — even muck stalls — simply to be there. It’s about YOUR memories, YOUR story, and YOUR look. So don’t delay: start telling your story today!